PITTSBURGH - Pittsburgh Mayor Luke Ravenstahl believes that the excitement for the game of hockey in his city comes pretty close to the passion exhibited by those fans of the Pittsburgh Steelers. PITTSBURGH, Pa. -- The timing is impeccable. In the week the NHL was set to announce to the hockey world that the 2012 NHL Draft would be returning to Pittsburgh at the Consol Energy Center, Pennsylvania native Brandon Saad of the Saginaw Spirit in the Ontario Hockey League was named the Canadian Hockey League Player of the Week. Saad, who also celebrated his 19th birthday Thursday, is from Gibsonia, Pa. He was selected in the second round (No. 43) in the 2011 NHL Entry Draft by the Chicago Blackhawks and played two NHL games this season before being returned to the Spirit, where he has posted 8 goals, 13 points and a plus-3 rating in only five games. Saad scored 6 goals and dished 4 assists in three games with a plus-2 rating to earn Player of the Week honors for games played through Oct. 23. Saad led the Spirit to three straight road wins beginning last Thursday -- notching the first five-point game of his career in a 5-2 win against the Brampton Battalion. Saad had a career-best 4 goals in the contest, including a natural hat trick on the way to being named first star of the game. 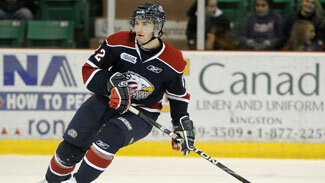 On Saturday, he earned second star honors after scoring a goal in a 9-1 triumph over the Peterborough Petes. He was again named first star on Sunday, scoring a goal and a career-high 3 assists in a 7-6 win over the Oshawa Generals. "And that's a pretty strong statement," Ravenstahl told NHL.com. It's also one reason Ravenstahl, Penguins Chief Executive Officer David Morehouse and General Manager Ray Shero were thrilled when NHL Commissioner Gary Bettman announced on Thursday afternoon that Consol Energy Center would serve as host for the 2012 NHL Draft. The first round of the Draft will be held June 22, beginning at 7 p.m. ET, and Rounds 2-7 will be conducted June 23, starting at 10 a.m. ET. Bettman said details for ticket distribution will be revealed as the event gets closer on the calendar. "Today is about the great hockey tradition in this city," Bettman said. "The increasing impact of grassroots hockey here in Pittsburgh and this spectacular venue to serve for the selection of our next generation of great players." Following some opening remarks, Bettman introduced a short video that included clips of previous drafts and local players selected. Also on hand for the announcement were local youth hockey players Mark Slomiany, Arthur Birman, Jackson Morehouse and Mario Williams. Each of the players wore their jerseys and posed for pictures with the four speakers. This marks the first time since the summer of 1997, when it was held at Civic Arena, that Pittsburgh will host the Draft. That year, the Boston Bruins selected Joe Thornton with the No. 1 pick and the San Jose Sharks chose Patrick Marleau second. The steal of the opening round in 1997 would have to be forward Brenden Morrow, who went 25th to the Dallas Stars. "The growth in terms of the interest in the Penguins is something I experienced personally growing up," Ravenstahl said. "When Mario (Lemieux) was drafted (in 1984), this clearly wasn't a hockey town. The youth that are now participating is a direct result of Mario, not only as a player but as an owner. "This might be a football town but it's a town that loves its teams and the Penguins. This building is here because of the passion of the fans. They drove us as local elected leaders to get it done and we did, and this is just one example of the reward." According to Morehouse, the Draft should generate approximately $9.1 million in direct spending; the 2011 Bridgestone Winter Classic produced $22 million. "In the last couple of years, we've brought a lot of revenue to Pittsburgh," Morehouse said. "The Consol Energy Center is living up to its promise. We said we'd have a world-class facility and we do. We said we would host world-class events and we are. We want to attract more and more events -- we hosted the Winter Classic last year, will host the Draft this year and now I'm going to be bugging the Commissioner about hosting the All-Star Game." Shero anticipates plenty of fun and excitement in the week leading up to the Draft. "It's going to be a hockey week in Pittsburgh," Shero told NHL.com. "It'll be great for fans. The events leading up to the event were something during the Winter Classic. My kids still talk about that. Let's face it, this is for the fans. Yes, it is for the kids being drafted, but we're also celebrating the game of hockey and that's great." Said Ravenstahl: "Just like we did with the Penguins leading up to the Winter Classic, we want to make sure this event is an interactive event. At the Winter Classic, there were 60,000 people able to attend the event, but not everybody that wanted to get inside did, so we had events outside the stadium with the ice rink for folks to come down and get involved. We envision a similar type atmosphere for the draft."